At the end of Dec. Amazon announced that it was adding book lending to its popular Kindle e-reader. The idea was similar to what Barnes & Noble had done with its Nook e-reader in that selected books could be loaned to someone else you know with either the device or compatible app for 14 days free of charge. The issue, of course, is you need to know someone with the books that you want to read that you haven’t already purchased yourself, or someone with the same e-reading platform as you for that matter. Enter the Kindle Lending Club. Starting as a group on Facebook where people could meet up and list the books they had to lend, and the ones they were looking to borrow, this grassroots effort has now grown out into its own site which has even secured $12,500 in angel funding according to ReadWriteWeb. Mind you, going from a page on Facebook to a full sit with funding all happened in under two weeks. Part of this might be attributed to group/site founder Catherine MacDonald’s background as a project manager, so she knows how to organize people and get them moving on a project. The services of the site are completely free, and the only limitations are those placed by Amazon itself. I.E. You may only lend a book once, and you can not read the book while it’s out on “loan”. The Kindle Lending Club will make its money from the numerous Amazon affiliate links around the site to buy various books, purchase an actual Kindle reader and so on. Add in that there is historical data of Amazon cracking down on sites using the word “Kindle” when in 2008 Amazon forced a site named “Kindle News” to change its name. We actually think the Kindle Lending Club is a lovely idea, but we also think it isn’t long for this world. The idea of e-book lending is to be done amongst a small group of friends, and somehow I doubt they ever envisioned it being done on literally a global scale between people who will probably never even meet one another. Add in the potential trademark infringements, and I’ll be surprised if this site is still around in a month. I say give it a shot, but don’t be surpsied if next you go to login that it has disappeared. What say you? 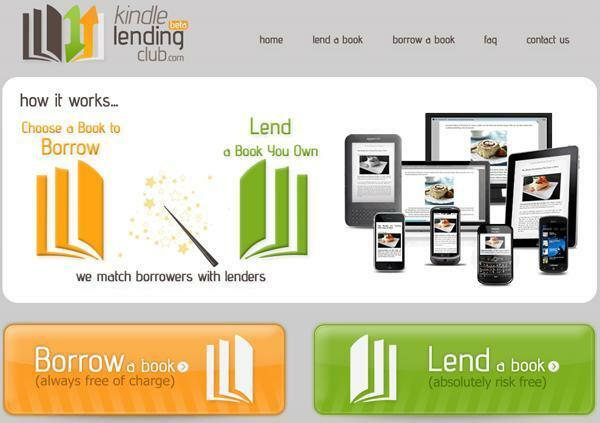 Would you give the Kindle Lending Club a try?